How does your writing/ creative process work? 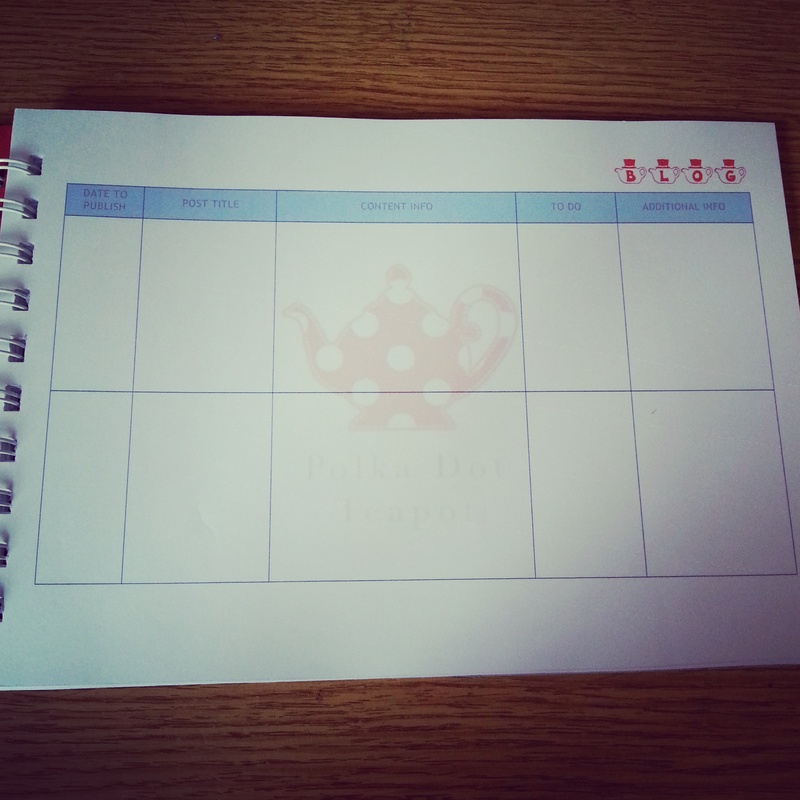 I like to jot ideas for posts down as I get them in my little blog planner I recently bought (Post here) but in terms of actual content I rarely plan it and just kind of go with the flow when I start writing. One of my favourite things to write are reviews on beauty products, and I also love to share my latest illustrations. Since I write about so many things it’s hard to pin point an exact answer. I like to write about beauty products as its a big interest of mine and I love to test new things. I like to share all my creative works like jewellery and illustrations because it’s always nice to hear other people opinions. I have a couple of new illustrations to share, some ranty life posts, a lovely stuffed pepper recipe I’ve found and a couple of book reviews. I’m aware that I’m about five years too late reading this book (still not seen the film!) I picked it up at a book swap and never got around to reading it until last week. At first I found it really hard to get into, and slightly confusing in the way it was written, however once I got past that it was amazing! In terms of the plot it was fairly simple, two people not realising the way they feel etc, but Nicholls has written it amazingly well. It’s quite gritty and near to the bone at times, but what I loved about this book is how flawed and interesting the characters are, and how they aren’t just good looking people who have a happy ending and are perfect all the time. It’s one of those books that makes you really frustrated, and you want them to just get together already, but at the same time I’m glad it wasn’t as predictable as that. I can’t really say too much without spoiling the plot, but if you’re into books with a twist, you’ll like this. Have you ever read this book? What did you think? 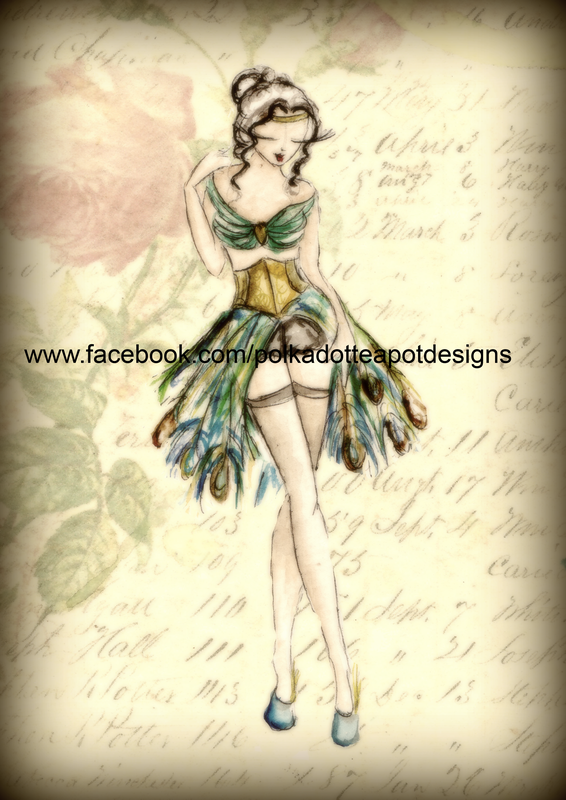 A quick post today to show you one of my latest projects, I put the outfit idea up for suggestion on Facebook and a lot of people said they wanted to see this burlesque lady in a peacock inspired outfit. I did three options for these prints, a plain background with the two illustrations, a colour background, and a sepia toned background. Let me know which is your favourite. Before I start this post I have something awesome to offer you 🙂 If you saw my review about Heaven Scented Bathbombs (read it here) and fancied trying them, the owner got in touch and is offering a discount to anybody who quotes Polka Dot Teapot to her when ordering. Links to the Facebook page are in the post! 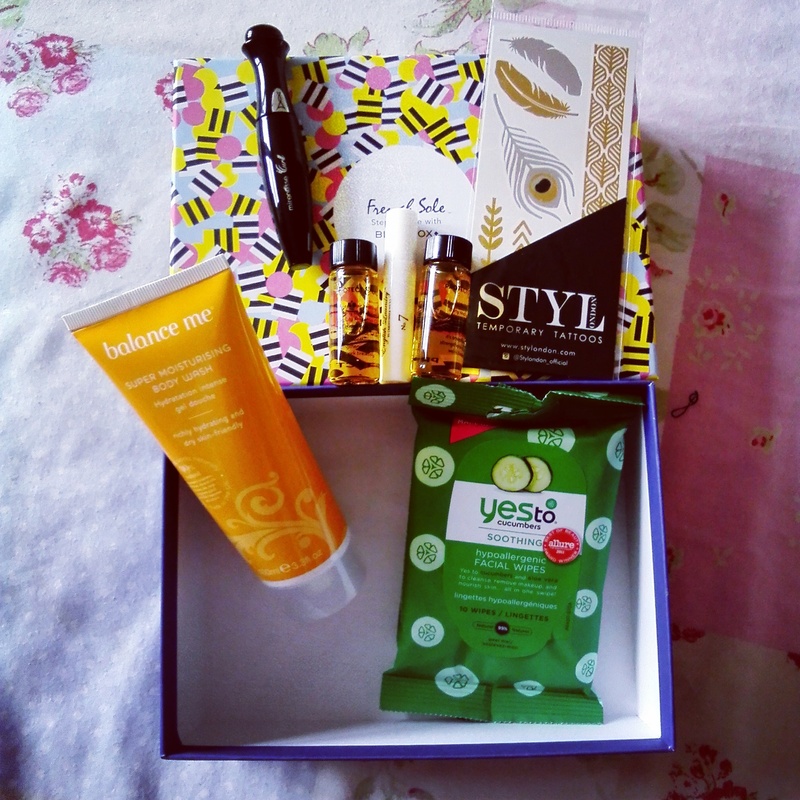 So over the weekend May June 2015 birchbox arrived I’m not that thrilled about this months box, it’s not as exciting as I was expecting it to be. But there is a few things I’m looking forward to using. The theme for this months box is “French Sole” and personally, I think the box looks like it’s been covered in Liquorice AllSorts. I’m most looking forward to trying out the STYL temporary tattoos.I I’ve seen these floating around Instagram and I think these just look so pretty and summery! These retail at £7.99 and are perfect for a cut summer look without the commitment of a tattoo. I’m also looking forward to trying out the Mirenesse ICurl Secret Wepon 24 Hour Mascara. I’ve been wanting a new mascara and this will be good to just pop in my bag or take with me when I go away. the retail price for a full size is £24. I also received a hair product in this box which is the Beauty Protector “Protect and Oil” and this retails for £16 at full size. I’m not normally a fan of Beauty oils as I think they make my hair greasy and I definitely won’t be used two bottles of this so I’ll be giving 1 to my friend Natalie to try as well. The most expensive sample I received in this box was the “English Laundry No 7 For Her” perfume sample. This retails at £60. I’m not overly keen on the smell of this as I find it quite strong, however I think as it wears off during the day it might be better. I’ll be popping this in my handbag so I can use it as a travel perfume. The full size product I have this month is the Balance Me Super Moisturising Body Wash. This claims to be richly hydrating and dry skin friendly which could be very useful for me, and this retails at £9 for a 100ml tube. The only thing that puts me off this is the smell, it smells quite leafy whereas I prefer more fruity body washes. The last, and most disappointing item I got in this months Beauty Box is the Yes to Cucumbers pack of ten face wipes. I’m not keen on cucumber scents and I personally don’t see face wipes as a luxury product I’d want samples of. I’ll keep these in my bag as they are travel size which is useful, but I’m not too thrilled that I have these. These retail at £4.99 a pack. And that’s that, not the best box I’ve ever gotten, but I am looking forward to using the mascara and tattoos. Did anybody else get a Birch Box this month? What did you get?